SPRING BREAK, patient WHOO! Spring break for me means two months of bashing my head against the wall trying to make myself stop playing games on Facebook because I haven’t been able to find a job. On top of that, I am poorly. Poorly and fully assimilating myself into life here by stealing their colloquialisms! Now that my second semester here is almost over, I can really reflect on how few friends I’ve made and how little I’ve learned about myself or the culture here. I think if I had been drinking way more and more often I would have had a fuller experience but instead I spent the semester actually reading every single book set me and turning my coursework in on time like a sucker. 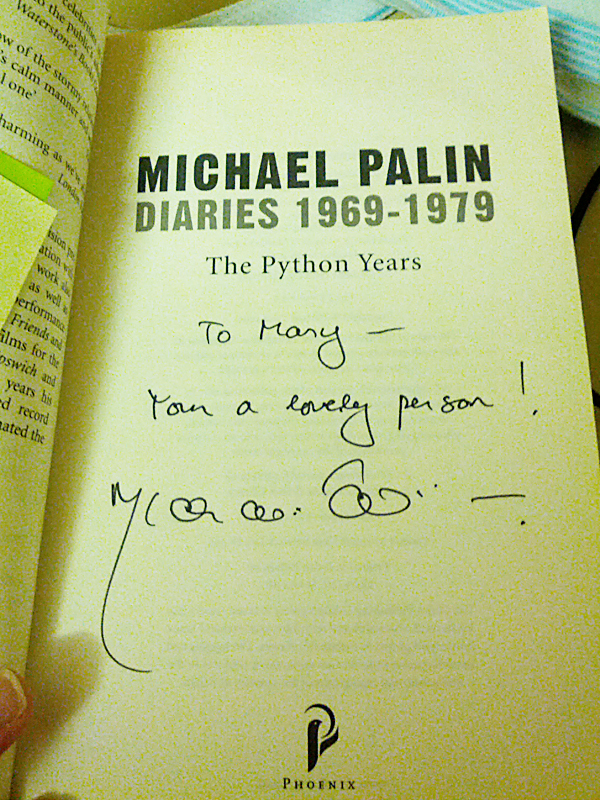 None of that matters, though, because I met goddamn Michael Palin and he said I was a lovely person. Completely unprompted. Except for that last part. 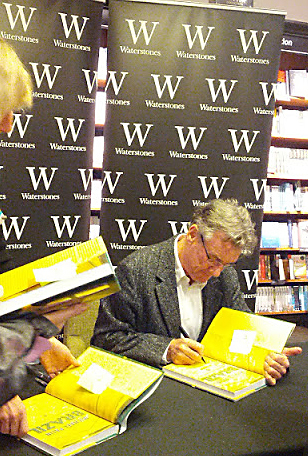 When I found out Michael Palin was having a book signing in Norwich I didn’t even know how to process the possibility of seeing the person who basically developed my sense of humor (and if you ever get to meet him, you can blame him). While waiting in line, I tried to think of what I could possibly say to him that did not involve the words “I would still bang you, just sayin”’ because that is extremely disrespectful even if it is true. Having lined up an hour early with my friend Bonnie and someone who is no longer friends with me because I would not bang them, just sayin’ (he was not enough like Michael Palin), we ended up being fairly frontwards in the line. 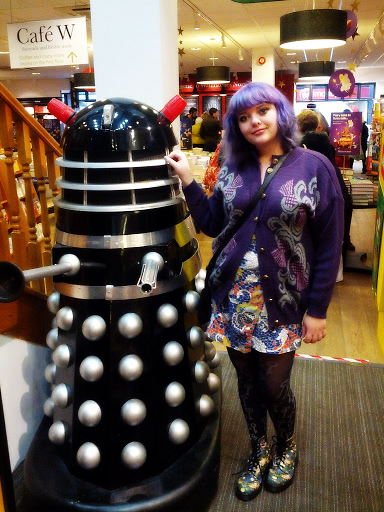 We heard we couldn’t take pictures with him so I took a picture with a Dalek instead. I wore a cleavagey dress and covered it up with a grandma sweater. Strategy. The time approached. One of my first and most heartbreaking celebrity crushes (SO MANY OBSTACLES), one of the funniest men alive, a friend of Beatles was right in front of me. “Oh. I’m glad I asked permission. That’s not crass, is it?” Which I’m sure seemed non-sequitur or just inane to him, but was actually apropos to my inner monologue which was instructing me not to be disgusting towards him because he is not just a living legend, but in fact a normal human being who probably doesn’t like it when people are disgusting at him. Also don’t you say a goddamn word about Michael Palin’s grammar. 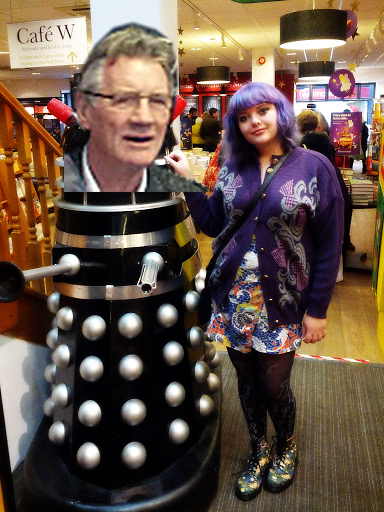 If Michael Palin wants to put the possessive there he goddamn will. I never need to meet anyone or have their opinion of me again. You are very funny, in addition to being your lovely person. I DON'T NEED YOUR OPINION, MOM. just kidding, i love you 🙂 you can thank michael palin for my being funny. also i have your brother bill's sense of humor. there may be some other major influence on my life, i'm not sure. I am totally and utterly jealous – I adore Michael – lucky you!!! !